Questions of investing and speculating always require context within time-frame. Players in all asset classes, professional or not, approach the game from their own perspective. Traders surfing the waves of volatility may be looking only days or weeks out. Investment managers overseeing a growth-oriented portfolio may be looking ahead months or quarters while a value-oriented portfolio manager may be looking years out. The 401k-watching worker bee may be wringing their hands at every market move and every ignorant headline despite the fact that they have 30 more income-earning years left before retirement. The game is tougher than ever even for the professionals and it’s difficult to decide a course of action with the information overload coming at market players. Determining what’s noise and what is actually valuable information is critical in making the right moves within your portfolio. I have long been pounding the table on building cash reserves while staying invested in the markets. I’ve also stated that I thought the downturn of late 2015 was the start of the next major bear market. I think that dip and recovery in 2015 was the bear waking up and the poor start in 2016 is investor realization of that bear. However, because everybody now sees it, the markets aren’t going to execute a full-frontal stage-dive. That’s not how these things work, right? I think we get a recovery into new highs followed by another much smaller correction and consolidation potentially followed by another new high. After that, I suspect all the bull energy will be fully used up and the bear will begin in earnest. Remember, these are simply my suspicions based on behavioral observation of the markets; nothing more than forecasts of potential outcomes. 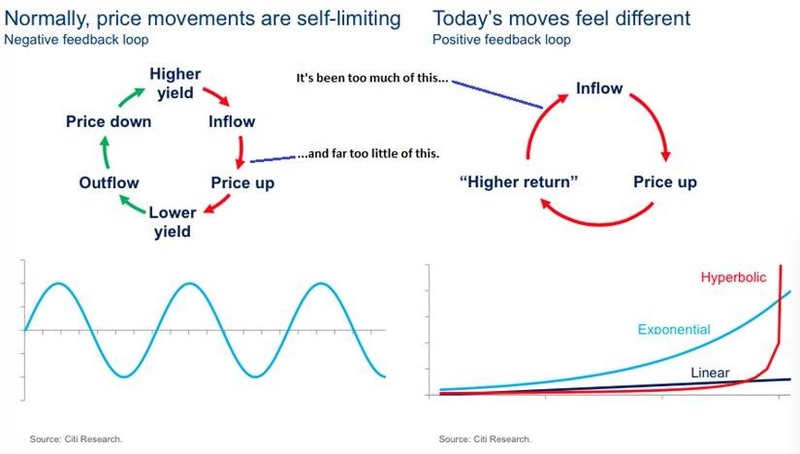 It’s been a long time since I’ve hit readers with some good old chartporn, but I’m in the mood to throw a bunch of squiggly pics out there to possibly help the reader better assess the market situation in 2016. Observe a 20-year, monthly chart of the S&P 500 along with some relevant indicators. 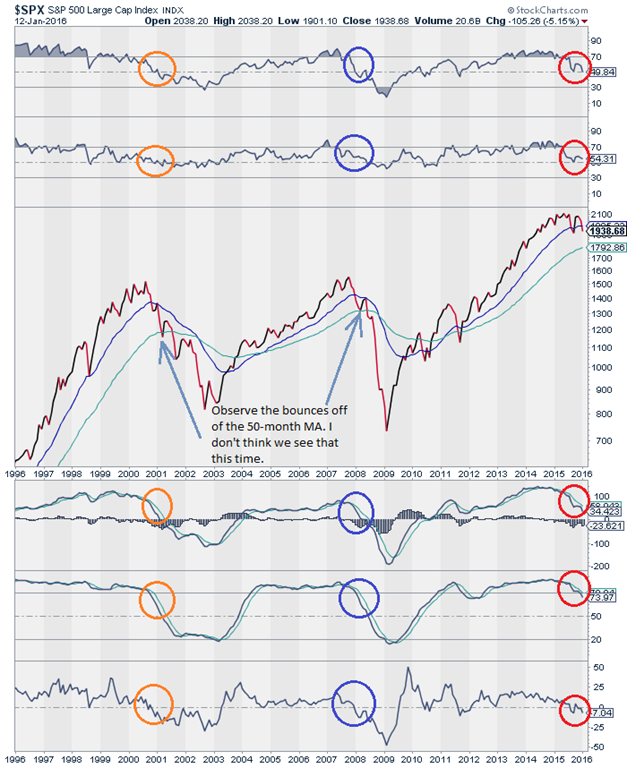 Observe the long-term breakdowns in the indicators matching the actions of 2008 and 2000. Does that mean crisis is imminent? Nope, but I do think it reinforces my call that a new bear has started. Notice also in 2001 and 2008, we saw strong support and a bounce off of the 50-month moving average. Too many technicians are looking for that and thus too many algorithmic shops will be front running ahead of that signal, blowing out orders to drive the market higher. I suspect this bounce we are currently in the midst of may be a bit stronger than people realize. Market players have been so used to the V-recoveries and yet they’ve already forgotten what they can be like. It appears that players are numb to the potential of a multi-week to multi-month V-bounce from the January 2016 lows. Despite what I surmise about a stronger than expected bounce, nobody can blame investors for either running for the hills or shoving their heads into the sand. 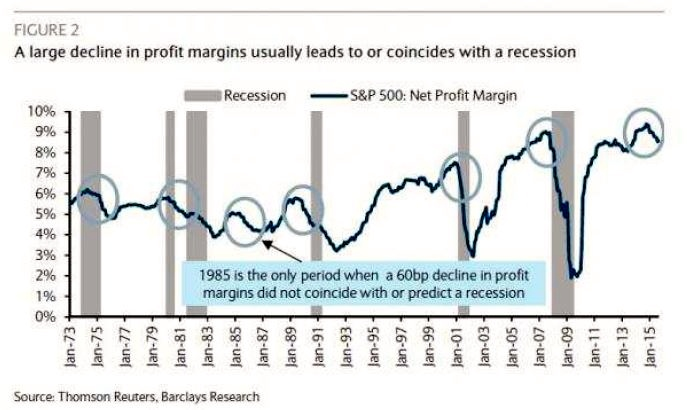 We’ve already seen the peak in net profit margins for this business cycle in the largest US corporates at the same time that markets continue to be overvalued, despite the corrective moves in December and January. Observe the following chart courtesy of ZH via Thomsen Reuters via Barclays. It depicts how the recession fuse has likely been lit. And with recession generally comes a bear market correction. Or is it the other way around? 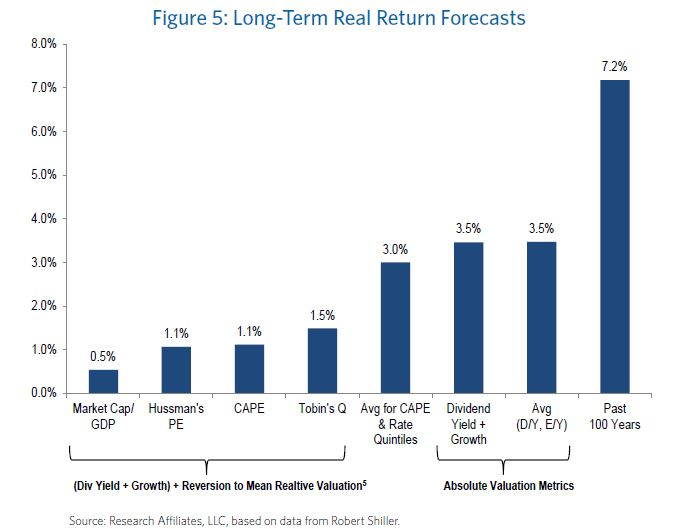 Regarding overvaluation, have a look at this comparison chart from AQR depicting market returns based on various starting points of the Shiller P/E. AQR is the shop that Cliff Assnes, billionaire hedge fund manager, founded and runs. This coincides with GMO valuation models for future returns based on current valuations. 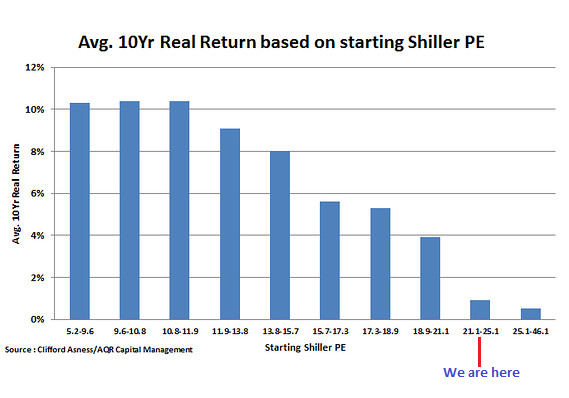 There are plenty of Shiller P/E naysayers who believe that the indicator is bunk. The fact of the matter is that evaluating a normalized 10-year look at P/E ratios is a simple and intelligent way of quickly gauging valuation levels compared to prior periods. Of course every period in history possesses its own specific circumstances as the backstory of the valuation levels, but the raw Shiller P/E paints a clear picture for equity performance going forward. Besides I don’t see or hear anybody calling Bob Shiller a dumb man. Despite what you may think of his ratio, Shiller is a respected academic even within the professional financial community. Let’s take a look at a chart from one of every perma-bull’s favorite bear-shaped piñata, Dr. John Hussman. Unfortunately, Hussman catches a lot of flak. Less so after admitting to his analytical mistakes coming out of 2011 but I think he catches a bad rap for simply calling it how he sees it. Hussman’s analysis is based on a quantitative and thorough study of the markets. Can the same be said of a vast majority of the financial blogosphere? No it cannot, including myself. Observe the Hussman Hindenburgs. They nailed the current action coming into Q4 of 2015. The criterion of the Hussman Hindenburg is detailed in the upper left corner of the chart. 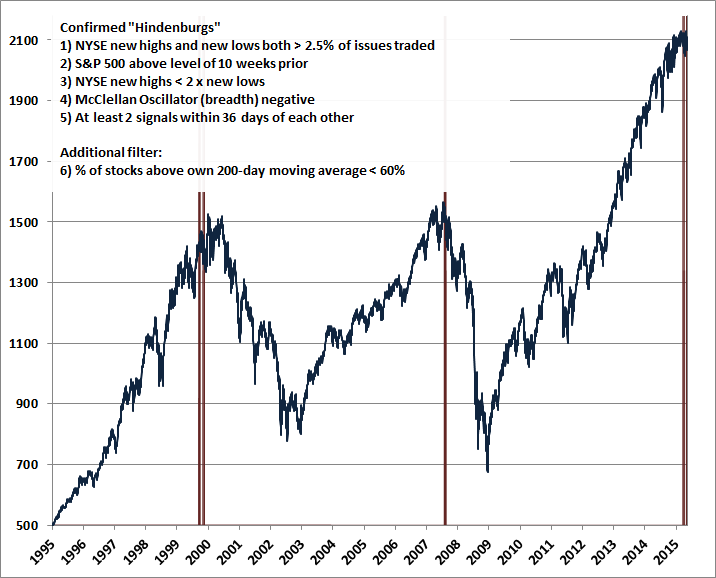 Dr. Hussman’s Hindenburg indicators proved to be quite prophetic in 1999 while essentially nailing the top in 2007. For your own long-term holdings, ignore these signals at your own risk. Dr. Hussman, like Dr. Shiller, is respected amongst fellow financial professionals. Have a look at Research Affiliates’ (“RA”) own analysis on current valuation levels. In a research piece they published in July of 2015, RA evaluates the differences in relative valuation metrics (CAPE, Hussman, Tobin) and absolute valuation metrics. They came to the following conclusion. May want to rethink that lack of EM exposure going forward, depending on your time-frame. Shall we move on to a couple of less orthodox indicators of potential trouble in the markets? Observe the two following charts which pertain to income as opposed to valuation or price action. In the first one, created by McClellan, we get an interesting correlation to total tax receipts for the US government as compared to US GDP. Notice that in 2000, the US crossed the 18% threshold and stayed there awhile before rising even higher at the beginning of the market selloff. For the GFC of 2007, America almost got to 18% but not quite and we still literally almost vaporized the entire financial system. Currently, we’ve reached 18% but that may or may not mean anything. 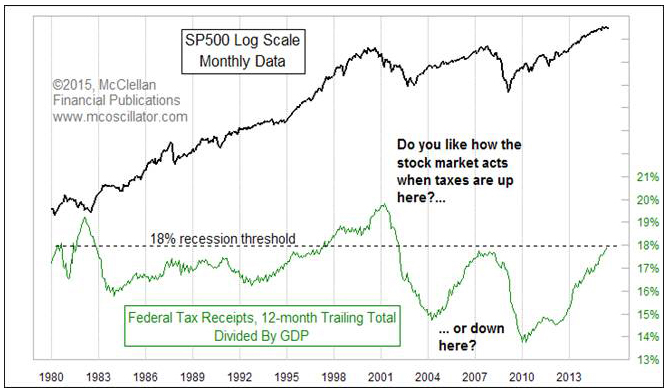 In each previous occurrence, tax receipts stayed at the level for months or even years so this is an indicator worth watching but only in conjunction with many others. Interestingly, federal tax receipts as a percentage of GDP currently reached 18% right before the markets began selling off last year. Repeat after me. Correlation is not causation, but the timing is still interesting. The other chart that doesn’t get a lot of coverage but is very well known is net worth of US households and non-profit organizations as a percentage of disposable personal income. You can find it courtesy of our friendly Federal Reserve Bank of St. Louis and their FRED tool. The grey vertical bars in the FRED charts denote recessions. It’s been a clear indicator in 5 of the last 6 recessions and we also had that annoying fakeout in 1987. Much like the prior graph, this particular chart should be coincident with additional economic indicators if one is attempting to forecast potential economic as well as investment outcomes. I want to move on to a particular area that everyone should be concerned about and that is nonperforming loans (“NPL”) at major banks. Not just at US banks but around the world. China’s commercial banks have raised fear levels in even the most seasoned professional investors due to their NPL levels increasing so drastically in 2015. I’ve long stated how debt levels in Italy have the potential to dismantle a good portion of the financial system because the Mediterranean Boot is such a key economic cog in the European Union. Some of the biggest commercial banks in Italy are on the verge of toppling during a period where now the ECB is less amenable to the previously used “bad bank” options. The pressure is beginning to mount for Italy’s leadership to formulate a strategy around potential bank failures. You might be inclined to observe the following chart and think all is at least well for the US. But take a look at the following chart in commercial-only loan performance and begin to understand why the total situation looks toppy from the economy to the markets. For the record, commercial loans comprise approximately $2 trillion of the outstanding debt within the banking system. It is clear to see that a bottoming and an upturn occurred before the last 3 recessions and market dislocations. Now we are currently in the early innings of an upturn in NPL. If commercial loan performance behaviorally adheres to what we saw in the prior two recessions, we will see at least an additional 2% of total commercial loans become impaired assets. That’s potentially between an additional $40 billion to $50 billion at minimum that banks will have to provision for. No easy task in light of current leverage levels and collateral utilization across the repo and derivative space. 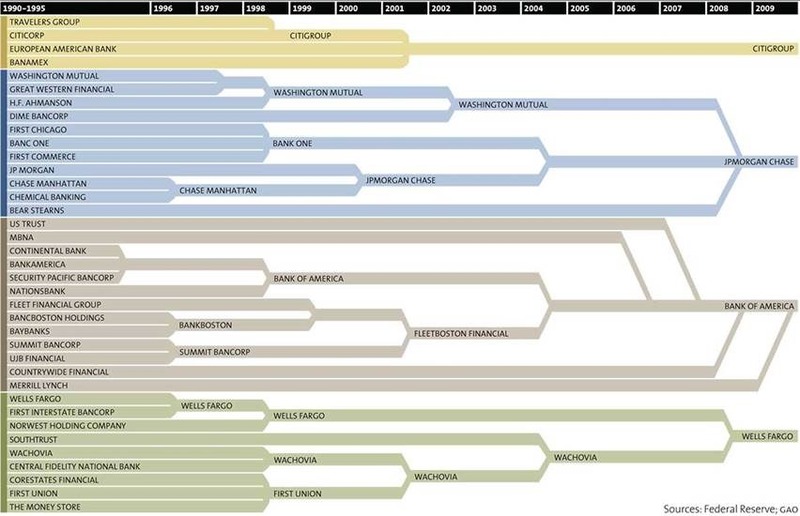 This is especially concerning because of the systemic importance of each bank to the entire financial system. Just look at the consolidation that has occurred since 1990. Couple this concentration with a lack of regulation allowed by Gramm-Leach-Bliley and you can see that debt impairment at the banks is not going to have a happy ending. And if you think Dodd-Frank was the answer to all of our problems, I might stop laughing sometime in March. What would work to alleviate a lot of the financial pressures around the world in the short term is a weaker dollar. I don’t say that as a proponent of a weaker dollar. Rather, I am stating that currency exchange due to a weaker USD could help sugarcoat revenue reporting across international corporates. It would relieve pressure in the management of reserves for countries with an excess of US treasuries. The oil price could stabilize temporarily but it is well-documented that abundant supply and less-than-expected demand is still the story. Commodities could lift and thus commodity producing countries who are already fighting with their reserves issue could see a double-positive impact. All these effects would be temporary as world debt levels are at unsustainable levels and a bear market for all assets has potentially already arrived. It just has yet to completely sink its claws and fangs entirely into the world’s financial system. Coming back to the initial question behind this post. Should the investing public be scared? Maybe not scared. Let’s call it aware. They should be aware of all the happenings that are occurring right now. Cash levels should be raised. Certain assets should be paired down depending on losses, gains, and risk exposure. More importantly it’s time to take stock in your own investing psyche. If you are building cash levels, will you have the courage to act at the appropriate time? That’s what raising cash boils down to. Do you have an understanding of the intrinsic valuation levels of specific asset classes that will motivate you to put cash to work? Aside from brushing up on your ability to properly assess valuations, take a look inside yourself and evaluate your ability to deploy cash when fear is running rampant and the nadir of multiple markets appears to be nowhere in sight.